If you want to check whether Vextractor will work for you - try it for converting your scanned images to the vector format. You can do that even with the demo version of Vextractor. It allows reading your raster files and converting them. As soon as you see the conversion results, you will be able to tell, what is faster: edit the converted image in a vector editor or draw it by hand from a scratch. If you use Vextractor, it is normally quicker to vectorize a raster image and then edit the result than trace and digitize the entire drawing from the scratch. Quite often, the quality of the original hardcopy or raster is obviously insufficient for the precise conversion to the vector format. In such case, you can use the collection of special raster filters implemented in Vextractor for the preparation of raster images to vectorizing. With filters like median, despeckle, remove isolated spots or gaussian smoothing you can sufficiently improve the quality of the original image. Sometimes, in spite of all efforts, the quality of the original scanned drawing makes the vectorizing and the further editing literally impossible. The automatic vectorizing is not perfect. That is true for all raster-to-vector conversion applications; not a single solution guarantees the 100% result. However, it does work and allows inputting a hard-copy drawing to CAD for the further quick and easy editing. It does not promise the irreproachable results at all times; nevertheless, it is a very useful tool for your work. The program has all tools necessary for viewing images: scaling, scrolling, and color selection. Vextractor features: TWAIN support for importing images from any scanner; automatic recognition of orthogonal lines, arcs, and circles; saving the original drawing's scale. Vextractor can convert halftone and color images to black-and-white images for further recognition; it can rotate and change the orientation of raster images. Vextractor has a built-in vector editor, which can be used for the editing of vectorization results. The program can create curves using Bezier splines, which allow obtaining images smoother than the original raster. By picking specific optimal parameters, you can obtain an image of curves, which look greater than the original image. The program also can be used for the digitizing of function graphs to be used in MS Excel and other mathematical applications. The special text format ASCII XYZ with a very simple structure is provided for importing to such applications. GIS professionals can use Vextractor's functions for digitizing hardcopy maps. The vectorizer supports such GIS formats as ArcInfo shape files and MapInfo MID/MIF. Specially for GIS users, the program has the capability of georeferencing raster images by points with known coordinates. The referencing via GeoTIFF and ArcInfo/ArcView World-files is also supported. The program supports a multitude of raster graphic file formats, including BMP, GIF, TIFF/GEOTIFF, JPEG, PNG, PCX, TGA, WBMP, PPM, PBM, PGM. 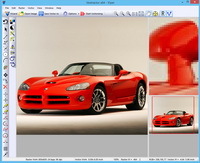 New: Now Vextractor have advanced algorithm for photo and photorealistic image vectorization. For design drawings the program applies recognition of various graphic elements of the image: circles, arcs, orthogonal lines, etc. Here, the program offers an opportunity to create a uniform grid, which can be put on the elements of your vectorized object. Vextractor contains a built-in advanced vector graphic editor, which easily allows you to add some corrections to your built vectors. Vextractor can be used for cartographic information recognition. The program supports such popular GIS formats as ESRI ArcView Shape and MapInfo MID/MIF. In order to uphold the highest standards in cartographic information processing, the program offers a coordinate binding system with an option, which allows users to save data binding coefficients to the format of GeoTIFF and world-files of ESRI ArcInfo system. Vextractor contains features, which are first of all intended for CAD and GIS systems: an opportunity to set your own coordinate system for vector images and an opportunity to specify a desirable size of a chosen image (width and height). Also you can assign Z-values (elevation) for polylines. Apart from that, the program is ready to help you with artistic and design work. Vextractor builds geometrics of raster images, which consist of Bezier splines. The program supports a series of vector formats, which can be imported into all popular packages of vector graphics: Encapsulated Post Script (EPS), Scalable Vector Graphic (SVG), Windows Metafile (WMF/EMF). The program contains a variety of additional features, such as a support for TWAIN32-compatible devices, an original three-window interface and more. Vextractor runs under all versions of 32bit Windows: Win98/Me/NT/2000/XP/2003/Vista. 2. Choose a raster file for opening. 6. Convert image to black'n'white by threshold. 10. The results of vectorization. 11. Click the "Save Vectors" button.